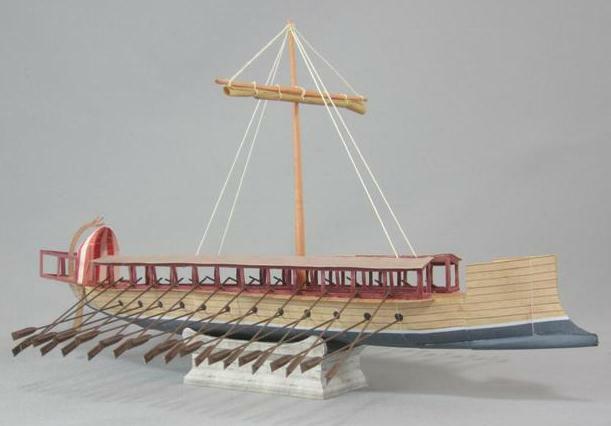 Here is a wonderful simple model of a 'Roman Liburnian / Fleet Liburnian' in 1/72 scale. Some more photos at photobucket HERE. The modeller, who has copyright and has made the model available for private use on the web, is a member of 'Mondorf Mens' Club' , 'Kallboys' - a group who unashamedly enjoy mens' stuff like bowling, modelling and drinking (in moderation). KALLBOYS. Thier linked model forum, with some nice diorama etc. is HERE. The ship is a two-tiered, 50-oared galley based on John Coates 1995 reconstruction of a Liburnian. 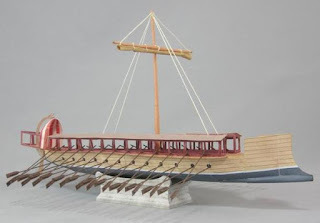 The Liburnian had much in common with the original ramming warship, the ancient dikrotic pentekonter, and with the Lembus as used by the Illyrians and Macedonians in the 3rd century BC. The Liburnian became the workhorse of the Imperial navy and was similar to a modern frigate, in that it was a modest vessel with a modest crew but flexible in patrolling sea or river. Such ships may or may not have a ram fitted. No 'Liburnian' has been found yet but we have sculpture and paintings which give the main evidence for what they looked like. The model would be great for wargaming with figures, just make it a waterline version and build in stiff card. The PDF is in German but if you cannot figure out how to translate this you probably could not build the model anyway. The model was put up on Papermau, a great blog for paper models, so I link there and you can make the jump to the PDF from there. PAPERMAU. Happy building ! If you think the model is good, why not leave an encouraging comment at Kallboys or Papermau ?